No waterproofing fabric touches baby. The PUL is hidden between 2 layers of soft polyester fabric thus very durable. A true-size cover in newborn through XL. Made in Canada. Rise snaps in size Medium only. Bummis is pronounced "Bum Ease", as in easy on the baby's bum (bottom). It's a durable wrap style cover. 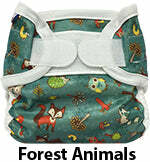 Generously cut to fit over nearly any kind of diaper pinned, unpinned or fitteds. 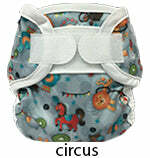 Great over Workhorse diapers. 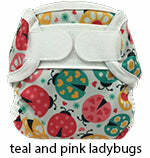 It has a very versatile fit which is great on just about any shape of baby; thin, average or chubby. Runs true to size, except wide babies will outgrow the medium before 30 pounds, narrow babies might fit medium all the way to 30 pounds, so consider that in your size choice if baby is over about 22 pounds. It's three layers- a waterproof laminate between two layers of polyester knit. That means no laminate touches baby on the inside because it's hidden between the two layers of knit. This polyester knit inside fabric will get a bit damp when the diaper is saturated, so you need a fresh cover a bit more than you do with an exposed laminate cover, but you can still re-use the same cover through several changes. If you don't want any plastic inside touching baby but you do want a machine washable cover, then this is a great choice! It is very durable. Another advantage of this covered, non-exposed waterproofing fabric style is that since it has the knit polyester is inside, the inside is not slippery. That means that the trifolded prefold doesn't slip around inside, because the inside is no slippery! It's a little easier to lay the prefold in there and have it stay put because it's not slippery inside. This is one of the very few true-size covers available. 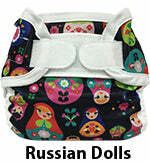 This cover is terrific because it fits nearly every baby very well and is very durable. 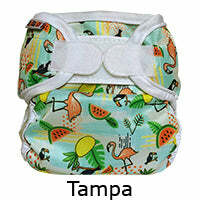 Bummis items are manufactured in North America and all materials are guaranteed to be free of lead, pthalate and BPA. Made in Canada. The material is stiff and the top portion is quite wide so it doesn’t fit my baby well. He’s long and on the skinnier end. It covers the cloth well but doesn’t allow for enough movement in my opinion. My daughter simply loves them . She is truly loving her new experience with cloth diapers and her new daughter Willow . These covers make all the difference in the experience . Highly Recommend them for sure. This is by far the strongest and most durable cover I've tried.